The Supernatural writing team and post-production is based in LA while the show, except for the pilot, is filmed in Vancouver. The showrunners are involved in both the creative and operational aspects of the show. Veteran Bob Singer was brought on by the studios to work with Eric Kripke when the series began. Eric Kripke stepped down as showrunner at the end of Season 5 but has continued to have creative input into the show. Sera Gamble, who began as a writer and story editor with Supernatural in Season 1 was been elevated to showrunner. At Comic Con 2011, Sera talked about how much taking on the role of showrunner, a job she said she'd recommend "if anyone ever offers it to you". She also talked about the continued involvement of Bob Singer calling him the secret weapon of the show. 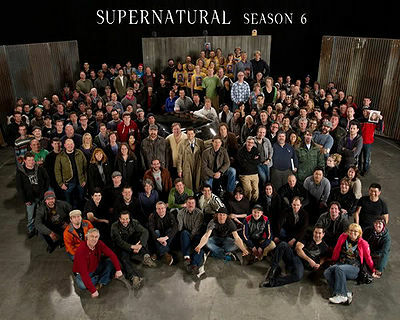 Many members of the Supernatural crew have been with the show since the beginning. They have been featured in behind the scenes features on the DVDs as well as in the Supernatural Companions, and even appeared at Conventions. They are so well known to fans, that the show featured versions of them in the meta/parody episode 6.15 The French Mistake. recurring cast members and those who have appeared at Conventions. For other actors, check the Character entries. members of the crew about whom we have some information in addition to their IMDB listing. Please feel free to add new pages or contact admin@supernaturalwiki.com for assistance. See Twitter for a list of all the official Cast and Crew Twitter accounts. Pages in category "Cast & Crew"
The following 409 pages are in this category, out of 409 total. Weren't You On Battlestar Galactica? Media in category "Cast & Crew"
This page was last edited on 21 June 2014, at 10:42.